In Australian Trailrider this issue we get the rare chance to ride what is one of the most wicked Yamaha WR450Fs on the planet. Chris Hollis threw us the keys to his CDR Yamaha and we took off like there was no tomorrow. We get buried in sand at Hattah, ride the beautiful Coffs coast and trek to Birdsville. It doesn’t end there though – we also test Glenn Kearney’s Husqvarna FE501 race bike. Yep, it doesn’t get much better than a big bore factory weapon. 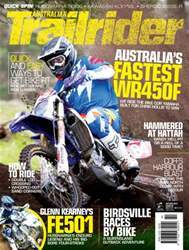 There’s plenty of tips and tricks as well as more bike tests and adventures in this issue so dive in and get dirty with us!